In a blow for Boeing, Indonesia's flag carrier is seeking the cancellation of a multibillion dollar order for 49 of the manufacturer's 737 Max 8 jets, citing a loss of confidence after two crashes within five months. 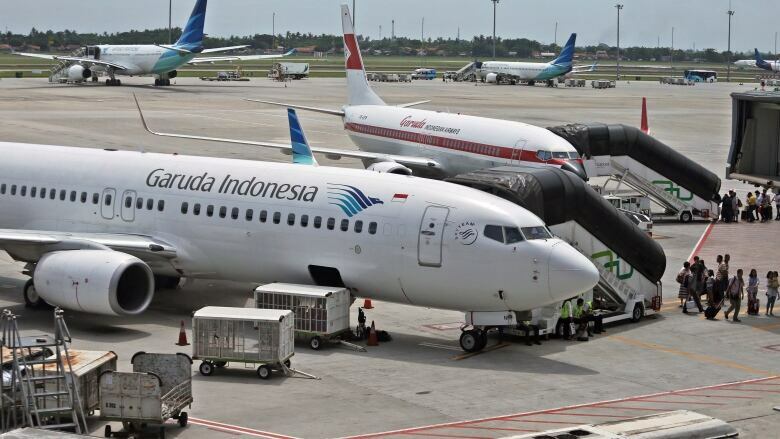 PT Garuda Indonesia, which had ordered 50 Max 8 jets in 2014 and had received just one plane last year, sent a letter to Boeing last week requesting to cancel the order worth $4.9 billion US, company spokesman Ikhsan Rosan said Friday. The carrier has so far paid Boeing about $26 million for the order. "We don't want to use Max jets … but maybe will consider switching it with another Boeing model of plane," Rosan said. He said Indonesian passengers are afraid to take flights using any Max model, whether it's the 8, 9 or 10 series. Boeing Co. shares were down $7.25, or two per cent, to $365.45 in afternoon trading. Broad stock indexes were also lower. Boeing shares have dropped 13 per cent since the Ethiopia Airlines crash.